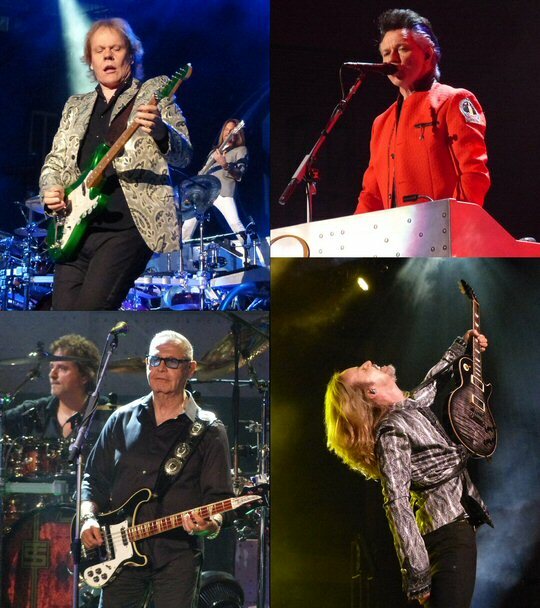 They are some of the most legendary bands in the music industry whose records burned up the charts in the 70’s and 80’s. So it was fitting that when Styx, REO Speedwagon and Don Felder rolled into Music City’s Ascend Amphitheater on the banks of the Cumberland River on July 22, 2017 for a hot one night stand on their “United We Rock” tour de force that the temperatures were nearing the 100 degree mark at showtime. 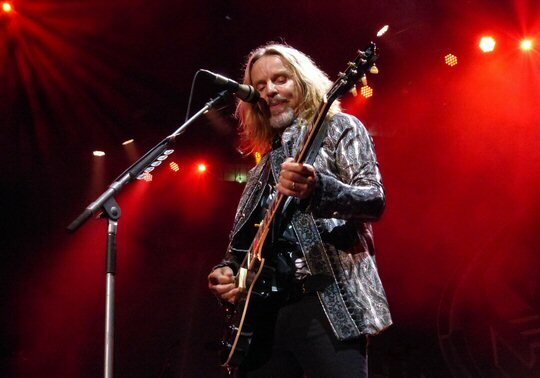 Styx was the closing act in Nashville and the band were on a mission to alert fans to their first new album in 14 years called The Mission which documents their concept story about mankind’s future trip to the Red Planet – Mars. We have seen Styx a number of times over the years beginning in 1981 with an emphasis on the current Shaw/Young led edition of the outfit. We can’t state this more clearly – this group never misfires – and they have successfully reached their destination of completing a thrilling rock show each and every time we have been in their presence. In Nashville, the story was the same except this time they had some brand-new and critically acclaimed music to offer to the Styx faithful. “Gone, Gone, Gone” got the show going in fast fashion with the guitar heavy rockin’ opener from The Mission. Lawrence Gowan – featured singer on this track – has had one of the more difficult jobs in rock ‘n’ roll taking the position Dennis DeYoung once held down. But, two decades on, the military clad Canadian was captivating and commanding while oozing with confidence in his role in the band. First-Mate Tommy Shaw was as sturdy as ever with the Captain James “J.Y.” Young nearby. Together the pair steered their ship with amazing precision as they invariably do. 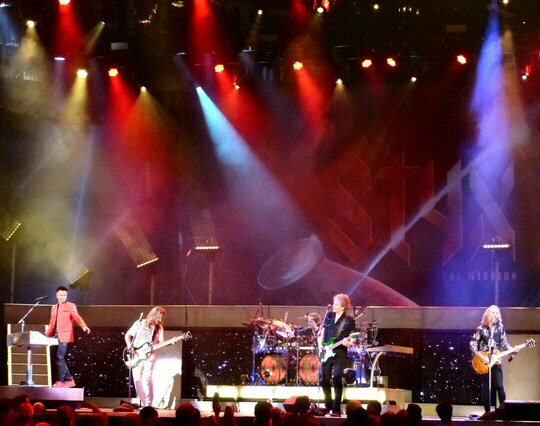 The thing about Styx – the guys always seem to be enjoying themselves onstage – and that feeling is contagious. Where many music acts turn cynical or become disdainful of their catalogue – that is not the case with rock’s most professional band. That’s probably why the fans keep returning in droves year after year. A highlight was provided by Shaw who thanked his family and friends for coming out to the hometown show before telling a story about crafting the tune that would become his first official statement in Styx. Tommy recalled he was visiting his mom’s house in Alabama scheming some leftovers when lyrics landed fully formed in his head. He asked his mother for a pad of paper and a pen then jotted down the words to what would become the title track to the 1976 release Crystal Ball. He added that he put that one through the paces with his band in local bowling alleys before J.Y. called him up and told him to bring himself and his songs with him to Chicago. Don Felder spent the bulk of his career in the Eagles flying high there until “the gods” decided that “Fingers” had to go. He took some time off to process that development and became a best-selling author – and when the time was right – he took his show back on the road. 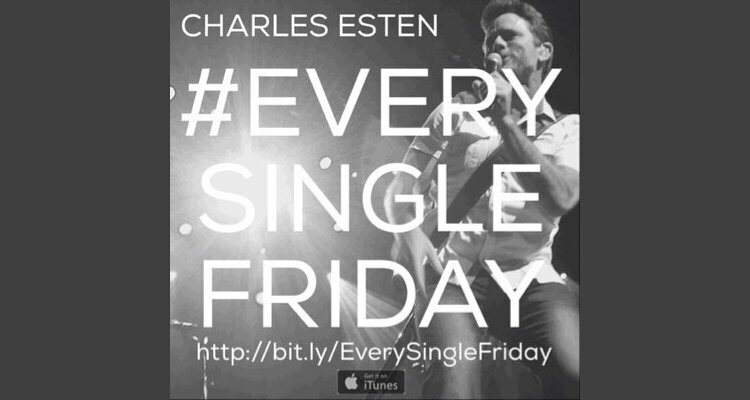 He now performs regularly following the release of his great Road to Forever in 2012. This was only the second solo album from the distinguished and heralded artist’s history – so the show he calls “An Evening at the Hotel California” – is weighted heavily with songs made famous by his former band. Felder has chops and a reputation to live up to and he always has a great support band backing him up – and since they’re doing a bulwark of the beloved Eagles’ catalogue – they all can sing very well. Felder emerged right at 7 p.m. looking snazzy in black and white wielding a Les Paul that he quickly put to work on the fan-favorite “Already Gone”. Felder had a banjo playing Tommy Shaw join him on “Take It Easy” before showing off some fantastic fret work on “Life In The Fast Lane”. Next, Don asked if anyone recognized his white Gibson double neck before calling out REO’s Dave Amato to trade licks during “Hotel California”. Despite the heat Felder’s well-coifed white hair looked just as good as when he started his set 50 minutes prior. Even though he didn’t break a sweat he and his band – including everyone’s go to bassist Kasim Sulton – looked like they had a great time playing for the knowledgeable Music City aficionados. 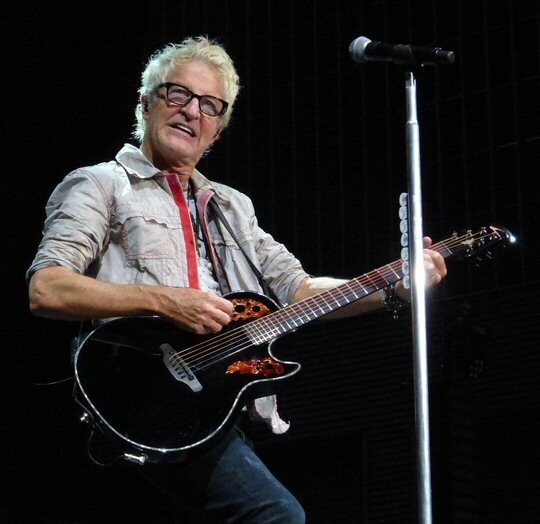 REO Speedwagon’s Kevin Cronin looks out on the assembled at the Ascend. 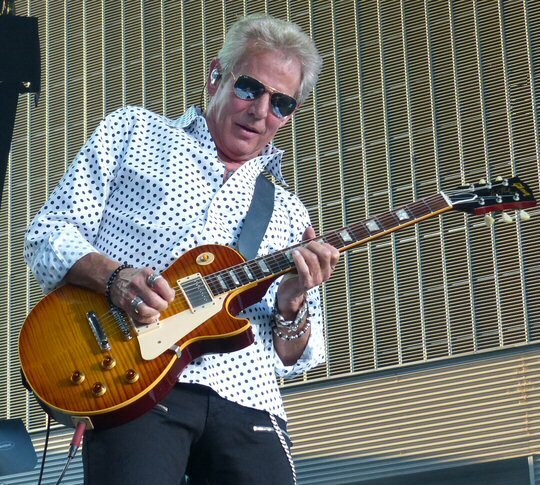 Sandwiched between these two stellar performances were heartland heroes REO Speedwagon and it was immediately apparent that lead singer Kevin Cronin was having some difficulties with his voice when they opened with their classic “Don’t Let Him Go”. The setbacks continued on “Keep Pushin’ ” that found K.C. surprisingly missing some words in the first verse and he went immediately for a large bottle of liquid soon after. To his credit he did admit to having a “raspy” voice before handing the mic over to Bruce Hall for his signature “Back On the Road Again”. We did a quick search and found reviews citing Cronin battling “laryngitis” two weeks ago and as far back as January of this year. So, it seems there’s a lingering condition that is unfortunately impacting their live presentation. Whereas the other two acts might be able to cover for an individual’s off-night due to the number of quality voices they have – when you’re a singular lead singer not at the top of your game – it’s noticeable. At least it was in Nashville. Cronin talked about the pride he felt from being a musician and songwriter – especially when walking on the streets of Nashville with a guitar case in hand. 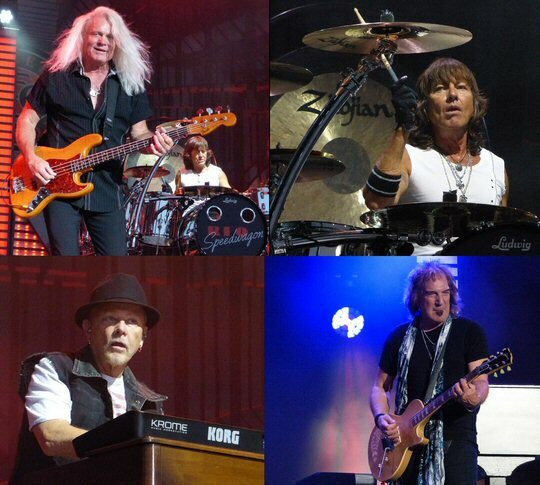 This thought and the dominant arch of the Korean War Veterans Memorial Bridge that looms over the landscape of the venue – seemed to inspire a non-setlisted audible of REO’s “Building the Bridge” – a type of song that Kevin said the world needed more of. During the encore he explained the writing process behind their biggest single “Keep On Loving You” and how he forced himself out of bed to transcribe the tune’s signature piano chords lest he forget them upon waking. Good thing he did because that one was a “game changer” for the Champaign-based musicians in the MTV era. The band pushed on with a powerful musical element peaking on the rockers “Riding the Storm Out” and “Roll With the Changes” that left the sold-out audience at the Ascend seemingly satisfied. The former was dedicated to departed REO guitar player Gary Richrath who was the man behind much of the group’s powerful songwriting prowess. On the latter they were joined by several special guests including Ted Nugent vocalist and Nashville local Derek St. Holmes to bring the curtain down on their portion of the multi-act show. 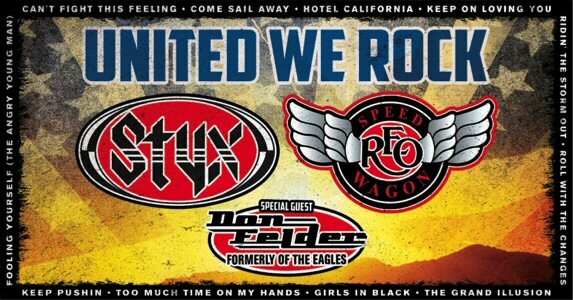 The United We Rock celebration gets a well deserved break at the end of July before reuniting for an East Coast swing in August that will bring this year’s festivities to a close. Cronin calls the gathering of friends “an unstoppable force of nature” while Shaw was predicting “an unforgettable evening of music”. Fans are invited to join the party at upcoming gigs including Bethel, NY (8/11); Atlantic City (8/12); Wantagh, NY (8/16); Holmdel, NJ (8/22) and more. The Ascend Amphitheater is an open-air event venue located in Nashville, Tennessee. Set inside the Metro Riverfront Park’s green space the amphitheater seats 2,300 in fixed seating, and 4,500 on the lawn and boasts a total capacity of 6,800. 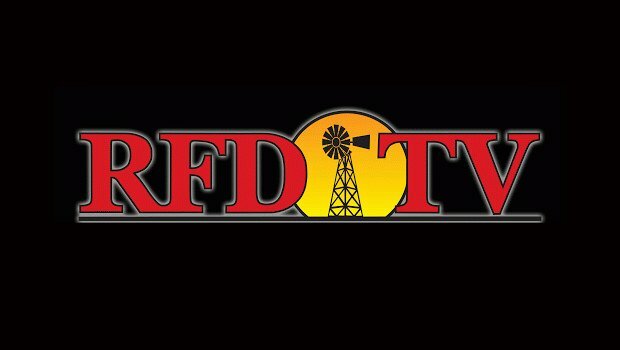 It officially opened in 2015 and has emerged as one of the more important destinations in the downtown offering some of the hottest touring acts in the country and beyond. Upcoming events include Foreigner, Goo Goo Dolls, Santana, Van Morrison and Depeche Mode. 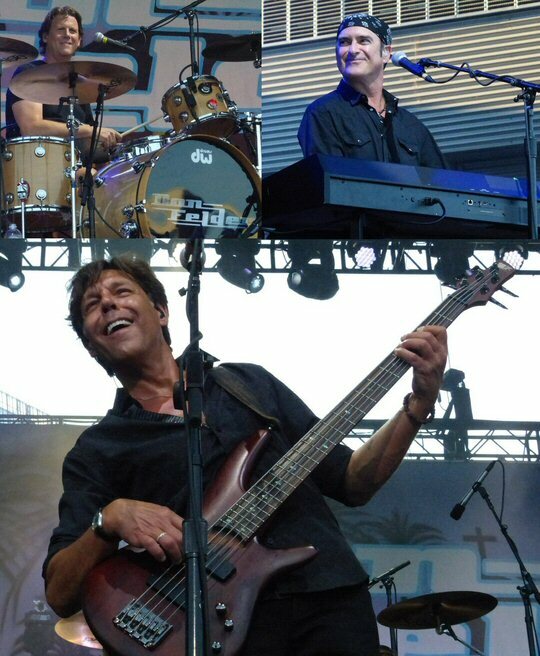 Kasim Sulton and smiles all around in Don Felder’s backing band.